Looks prickly. I suspect the name of the plant means something to you, but I don’t know enough botany to track it down. If you click on the picture, it says “thistle in crete” at the top of the window. A search online turned up a number of associations, but I thought the above most likely for a Cretan thistle, though there was another connection somewhere with Dionysos. Given the way this story has been going, the thistle is more likely to have a mythic than a mundane meaning. Thistles aren’t actually that bad as plants, but they are seen to grow where they shouldn’t and take up room in fields. Ancient curses on the earth — a definite possibility. Making the thistle as an expression of grief? Another possibility, given the way things, gods and people are created in Hitherby. I’m unused to thinking symbolically with fauna; I’ll have to come back to this. The symbolic meanings of plants are a significant element in Rebecca’s game Nobilis. Googling for websites on the language of flowers reveals that the Victorians had no consensus on the meaning of thistles: “aggressiveness,” “defiance,” “defense not defiance,” “misanthropy,” “hardihood,” “retaliation,” and a half-dozen other possibilities come up. I couldn’t find a meaning specific to Cretan thistle (if there is a variety by that name). I don’t have time to hit the library today and look for offline data on floriography, alas. Little bit of Martin getting in there too, yep. I suspect that having a cold with fever had some role in it. I know that flower language is big in Nobilis, but not having anybody to play games with anymore, I haven’t had the heart to read the entire book. It’s too beautiful and it makes me want to play. So I haven’t read or memorized everything, though I did read all the bits of fiction. I’m not sure if Victorian-era symbology is the way to go here. I’d pin my hopes more on the Greek mythos if I was researching, because of the word “Crete” and the Greek characters who currently figure heavily in Nobilis. Of course, the thistle here may also represent a private symbolic language, but then doesn’t everything?
. I couldn’t find a meaning specific to Cretan thistle (if there is a variety by that name). I don’t have time to hit the library today and look for offline data on floriography, alas. Good research on Victorians! I don’t have time, either; besides, I enjoy making things up. 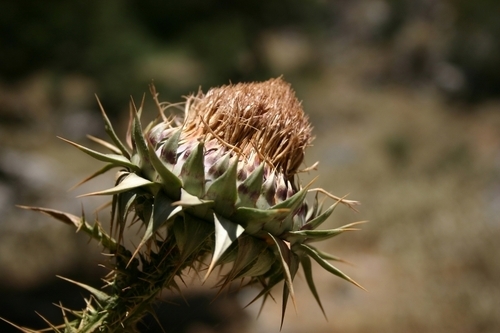 I did find in a hasty Google search that Greece does have thistles, though I couldn’t tell if there was a specific Greek variety, though I suspect there are several. Thistles are related in some way to artichokes. Artichokes have hearts, so maybe thistles do too. But unless you take a bud like this one apart (which I havenâ€™t), itâ€™s rather hard to say one way or the other. And some of them are perennials, for what itâ€™s worth.